It's Monday again, which means not only is it Meal Planning, but it's also weigh-in. Not unexpectedly, I put on 2.5 lbs, however I had a brilliant time putting that weight on! I had a meze one night, loads of slices of takeaway pizza (someone on Twitter said the trick to having a pizza is to eat it fast, before your body realises its actually full up. Wise words!) bacon sandwiches until they were coming out of my ears and loads and loads of white bread, with lashings of butter. I also managed a cream tea and a pasty, but I was on holiday in North Cornwall, its against the law to not have one of those......isn't it?? However on Sunday, I was back on track, kept to a Syn free day with grilled bacon sandwich, brown bread (no butter) and a lovely roast chicken dinner. I'm using the leftovers for a chicken stew and a chicken and noodle soup. And leftover's leads me onto a beautiful blog I've discovered called A Girl Called Jack. I saw Jack on BBC breakfast over the weekend, talking about the campaign to eat for a £1 a day for five days called 'Live Below The Line'. Jack's blog is all about living frugally and her recipes piqued my interest. I try to keep my food bill down, it averages about £80 a week (for everything including washing powders, toilet rolls, that sort of thing), but know I could do better. When I first married, I had 3 months of feeding my little family of three with the child benefit which was about £10, twenty years ago and although a struggle it gave me a sense of achievement. Jack however has been doing it through necessity for 2 or 3 years now and she's got it down to an art form. So, I'm going to be trying one of her recipes each week and being more mindful of the food which gets wasted in my house. Onto my menu planning this week. Lunches will be leftovers from the night before with salad with plenty of fruit to keep me going throughout the day. So I am planning for success, I will lose that 2.5 pounds very soon, I'm determined! What have you got planned? Let me know by leaving a comment or why not join in yourself with At Home With Mrs M who hosts this linky. 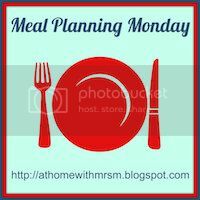 Click the image at the top of the page for more meal planning inspiration. Hello, i feel that i noticed you visited my blog thus i came to return the desire? .I'm attempting to find issues to improve my site!I assume its adequate to use some of your ideas! !